There’s a difficulty in telling someone what you dreamed about. You may not remember all the details, you might feel weird sharing something so personal and out of your control. But in remembering dreams you have to fill in the gaps yourself to create a coherent story – one that may in fact provide insight to who you are and what you think. Mark and Beth Dish Dreams successfully conveys these ideas and uncertainties. It presents seemingly unrelated sequences which, put together, lead to a singular feeling. 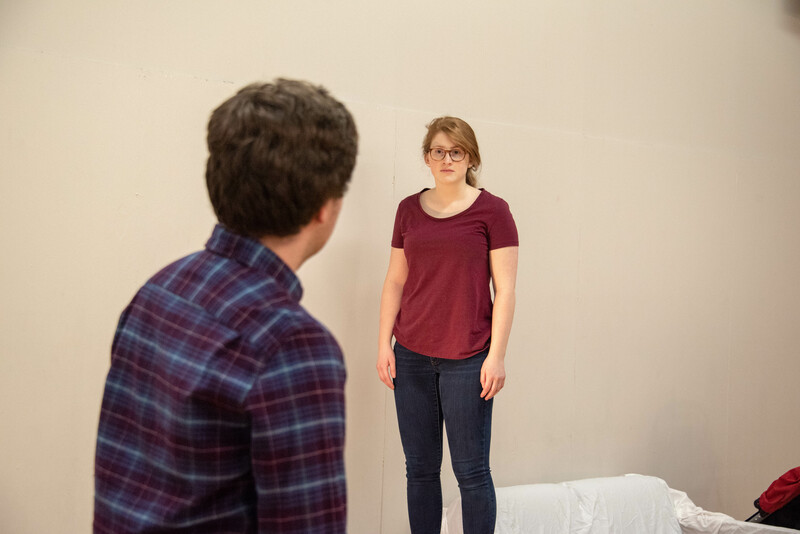 Created and directed by Cara Geser ’20, the ensemble-devised Mark and Beth Dish Dreams introduces us to “two old friends reconnecting after a long time of distance.” In their catching up, we may lose sight of what is the “real world” and what is the dream world, but everything is given equal weight. 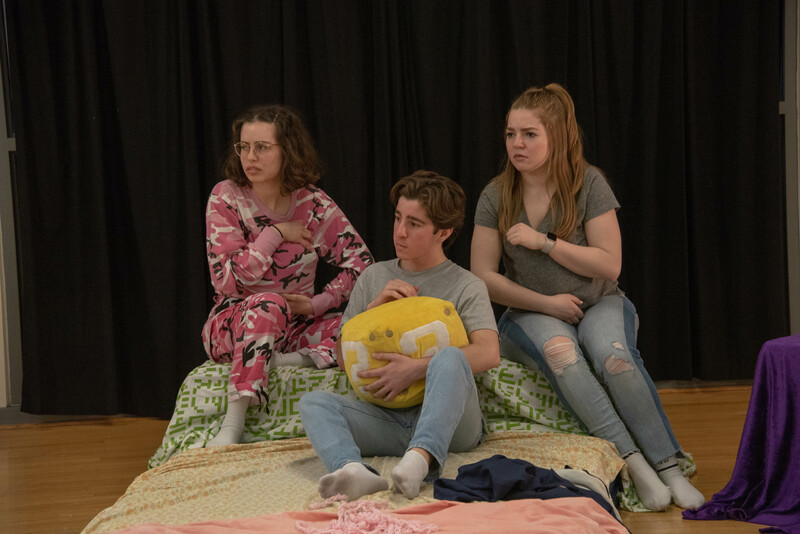 Even Mark and Beth themselves are malleable, as Beth is played respectively by both Bridget Schwartz ’21 & Lucy Holden ’21 while Mark is played by both Carter P. Jones ’22 and Jonathan Moran ’22. Amelia Power ’20 inhabits multiple roles and serves as a quasi-narrator throughout. It takes you a second to realize the piece has begun, almost as though you are dozing off and fading in and out of sleep. As the sound of static slowly fills the room with the ensemble, it feels like you’ve adjusted an old television set to the right channel. Mark and Beth sit quietly over tea as they begin to discuss various dream episodes. 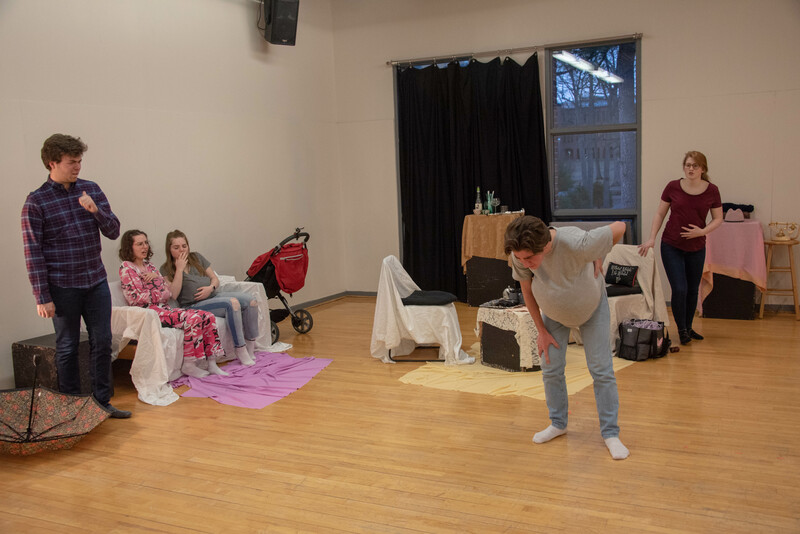 The play knows when to pull the rug from underneath the audience, most notably after a comedic scene in which all four Mark and Beths are pregnant. After one Mark (Jonathan Moran) gives birth in a jarring and funny scene, a second Mark (Carter Jones) discusses losing his baby. He later goes to the cashier of a fantastical “baby store” and attempts to get his baby back, asking about return policies and detailing his loss. We are able to interpret Mark’s loss how we see fit, whether it is literal and absurd, or metaphorical in service of a mysterious base reality. One section features what is seemingly described as a dream within a dream, as Beth discusses mingling at an Oscars party, only for Scarlett Johansson to whisper the phrase “magnum larpus” into her ear, a phrase that reappears at numerous points. The piece concludes in a similar way to its beginning, as we return to the static from before, only to watch the ensemble break down the set. 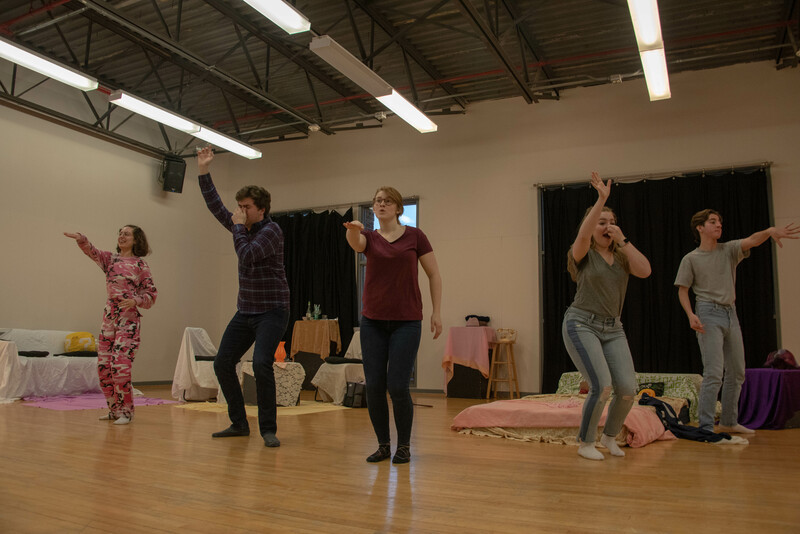 This comes after a dance number to “Girls Just Wanna Have Fun,” in which Stage Manager Taylor Goodwin ’20 joins the ensemble to color the scene (waving gels over lights that decorate the space) and lead a procession. The importance (or lack thereof) of what is “reality” and “non-reality” comes not through any clear answer of what is a dream and what is not, but instead in how each scene plays out in its own in relationship to the rest of the play. The danger and beauty of dreams comes through their invitation for interpretation, something which Mark and Beth Dish Dreams achieves by theatrically blurring the lines of reality and fantasy. Max LoSardo is a junior STLN staff writer.